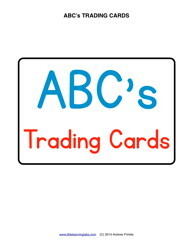 These ABC's trading cards come with 250 cards! There are at least 4 words per letter of the alphabet, but some have more. There are also basic Upper/Lowercase letter cards for each letter. Included are several sorting activities and games you can do with these cards. MAKE SURE TO CHECK OUT THE BOARD GAME THAT GOES WITH THIS! 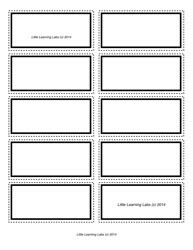 Make your own vocabulary cards with these quick cards. At 10 per page, they are economical in ink, but classic on style. They also line up nicely if you want to cut them on a giant paper cutter after printing several pages. I suggest laminating and/or printing on heavier paper. Then you can use a Sharpie to write the words on there. Practice collecting your spelling words into groups according to beginning, middle, and ending sounds. 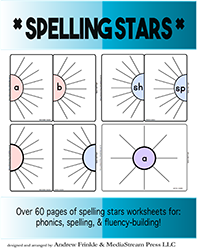 There are over 60 pages of useful graphic organizers to sort by letters, digraphs, and blends. Vocabulary Continuums is a way to use graphic organizers to arrange many similar words with different shades of meaning. 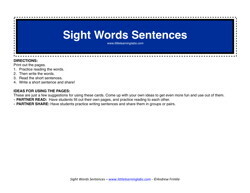 This allows for students to have better recall of words because they associate words with similar meanings. 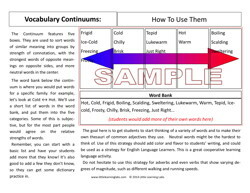 In this way, a student might know that words like: warm, tepid, hot, cold, freezing, toasty, and other words of these type all have to do with temperature. Practice writing words of different lengths with this game and exercise. 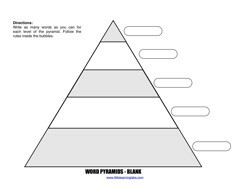 This version features only 3 levels in the pyramid, making it better for grades K-1 students. Great ESL strategy, too! There are several different games and styles of using these activities included on the directions page. Practice writing words of different lengths with this game and exercise. 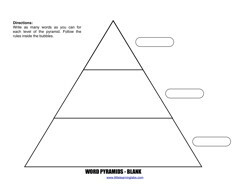 This version features 5 levels in the pyramid, making it better for grades 1-3 students.